Q: What are the differences between the pyramids from different generations, like early ones vs. the later Pyramid Arcade ones? Q: How many games in Pyramid Arcade are good for two players? Q: Are Xeno stashes coming back? When will I be able to get those colors again? Q: What size are the decks of cards in Pyramid Arcade? Q: Hey, do you still have any more of those tubes that pyramids used to be sold in? Q: We think we broke the game. Are we doing it wrong? 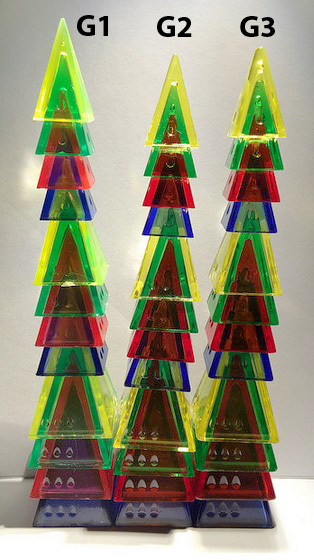 A: Just before Pyramid Arcade came out Pyramid fans were curious about that newest generation of Looney Pyramids, which would have slightly rounder tips than the two previous manufacturing runs (which were themselves ever so slightly different from each other). Our goal, of course, is for all pyramids to be interchangeable and as otherwise identical to the other versions as possible, but concerns were expressed about stacking new ones onto old ones and having them look funny or something. So, Andy put together a test set consisting of four trios from each of the three production runs, with freshly opened pieces of each type, and he carried this set around in one of those awesome round tins he’s so fond of. These were his primary play-testing pyramids for a while, and he spent a lot of time stacking, nesting, and playing actual games using this set, to make sure the three types would all interact smoothly. He was happy to report that they’re great! These first three photos show that G1 pyramids do stack taller than the others, but he didn’t find that it mattered — or was even noticeable — in actual play. The next four photos show the pyramids in mixed trios and stacks. Note that for the stacks of nests shown in the lower right photo, each nest has a mixture of all three generations of pyramids. Again, there are some very slight differences in how they stack, but it’s not something you’d notice, let alone feel is a problem, in actual use. This last photo just shows G3 pyramids being stacked up in weird ways that, as you can see, are all still possible. In closing Andy would like to say that, while he used to worry that rounder-tipped pyramids would feel inferior, once he actually had them in hand, he felt that, not only were they perfectly acceptable, he had to admit they were actually pretty nice. Maybe even better. A: Almost every single game in Pyramid Arcade can be played with 2 players. Only a couple are probably still better with more (or less! ), and many are 2-player only. 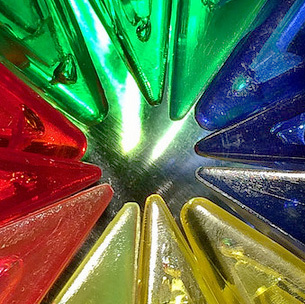 Color Wheel is perhaps best viewed as a solitaire game, but it’s fun to play cooperatively with two, or you can play it competitively by seeing who can solve it in the fewest moves. 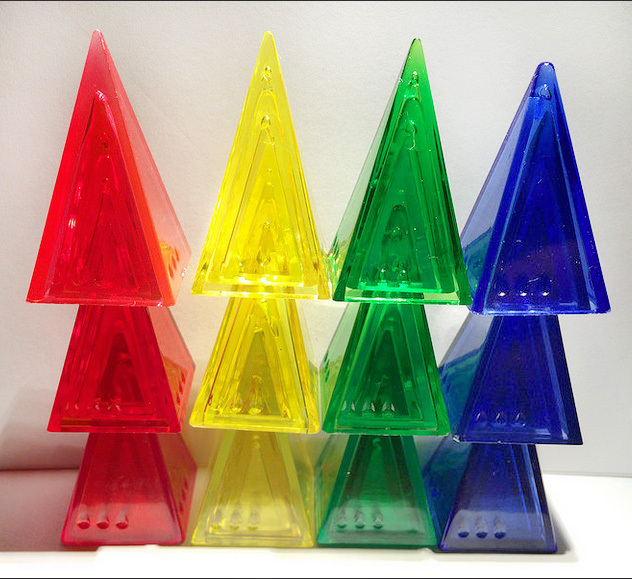 A: Those colors of pyramids (cyan, orange, purple, clear, white) will be available again, but not in that particular set. 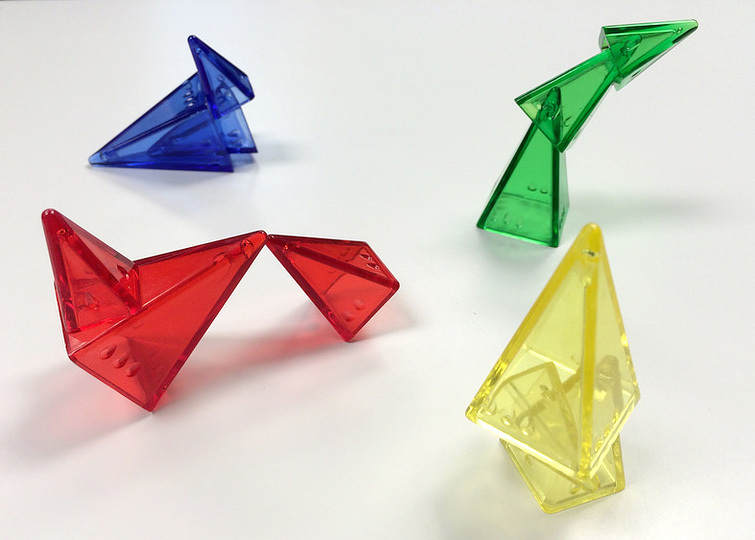 When we produced Pyramid Arcade, we switched the primary way we sell pyramids (again!) 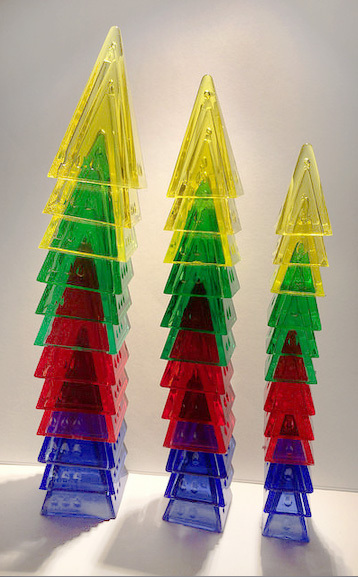 Since Pyramid Arcade comes with 3 stashes of 10 colors, we plan to make expansion sets at some point, but they will likely be in sets of all ten colors, instead of separate packages of five Rainbow or five Xeno. 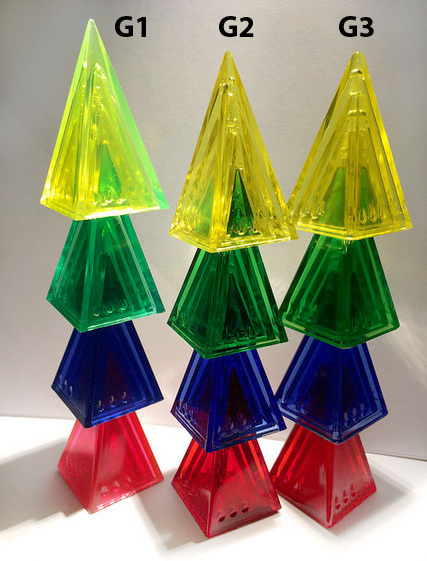 Also, we changed the design of the pyramids themselves, ever so slightly, so that the tips are a little bit rounder. This was so that we could pass safety testing for EU markets. As for WHEN we will be producing expansion sets of pyramids, that will be the next time we have a run of Pyramid Arcade printed, which will all depend on how fast we sell through the first print-run. A: There are three different decks in Pyramid Arcade, each a very different size. The Zark City deck is like a regular deck of playing cards, except that it has five suits and the cards are square. Measurement (roughly, using a ruler) is: 2 & 5/8″ (7 cm) on a side. The Pyramid Arcade deck, which has a card for each game in the set, has more familiar dimensions. I believe they would be called “poker sized” (wider than “bridge sized”). These are 3 & 7/16″ (8.75 cm) tall by 2 & 15/32″ (6.3 cm) wide. The Twin Win deck has miniature-sized playing cards which measure 2 & 11/32” (6 cm) tall by 1 & 9/16 (3.95 cm) wide. A: We regret to tell you we are long since out of the tubes. We had some left over for quite a while after we switched, and kept them up for sale for folks who liked them, even though we found that they were actually kind of sub-optimal (or years in storage had made them so). They were quite tight in the corners, and the pyramids would stick. Even with all that, and how slowly they sold, we’re completely out of them. A: A good rule of thumb for any game is that if you find that you have several possible interpretations of a rule, the one that breaks the game is probably NOT the correct way to play. Note that if you only see ONE way to play a card, and it seems broken, please do search our FAQ for known errata or clarifications*, or contact us. It could be a typo, or a new interaction that we have not considered. *The fastest way is to search on the name of the card you’re having a problem with.